The Essa Stallions and Maniwaki Mustangs kicked off the CPJHL Semi Final Series on Saturday night; in the battle of the thoroughbreds. Before all of the fireworks would ensue, 2 very special game presentations took place before puck drop. Shawn Marson; a player who was signed at the beginning of the season to Essa, was there to be honored. Marson, a native of Kitchener, ON had experienced a severe heart condition before ever getting a chance to lace them up for the Stallions. It was thought that Shawn would have to give up the game he so dearly loves both competitively and recreationaly. Shawn proved his prognosis and doubters wrong, as he has now been cleared to begin lightly skating. Shawn stepped onto the ice to standing ovations from the crowd, and stick taps from his teammates and peers. We are and always will be #ShawnStrong. The second presentation of the night came in the form of a ring. Not a championship one, but a Coach of the Year award being presented to the 2018 coach of the year; Sylvain Cloutier. The 2017/2018 season was a historic one; not only in the CPJHL but in Junior Hockey across Ontario. That years Stallions finished with an overall record of 48 wins and only 3 losses (2 in the regular season, 1 in the playoffs). That record included a 27 game unbeaten streak. 280 goals for; 80 goals against.12% PP and a 96% PK. "It's a great accomplishment. But this isn't about me. It's a team award. Without these players, our other front office staff and Langer (GM and Assistant Coach David Lang), this isn't possible. I'm humbled by this, but right now our attention is strictly on this years playoffs" Cloutier said. It seemed as though both presentations got the boys going, as "The Herd" came stampeding out of the gate! before the 7 minute mark, the Stallions erupted for 3 goals. Daniel Spannar opened the socring, followed by a "Bar South" snipe from Parker Stewart, and a nice little shot of his own on the PP from Tim Holmstrom. "The boys came ready to play tonight. Right from puck drop we did what we needed too and played Stallion hockey. We have a big game coming up on Tuesday night in there barn. I don't expect it to go the same way as tonight. They're tired. They've battled for an entire series already, playing 4 games in 4 nights. They have had time to recuperate, so it will be a hell of a test" said Cloutier. "These games are hard. It's hard for the boys to stay revved up for all 60 minutes when you get a big lead like that, but it's something we're working on. We never want to take the foot off the gas, because things in hockey can change in a second. But we're working on managing this, and getting our focus in for a full 60 minutes. I think its natural to get complacent with a big lead, but we have to take care of our end just as if it were 0-0 for a full 60 minutes. Jamesy played well and deserved the shutout, but we let him down" said General Manager and Assistant Coach David Lang. The Herd now travel north to the friendly confines of the Gino Odjick Arena in Maniwaki, Quebec for game #2 of the best of 3 series. 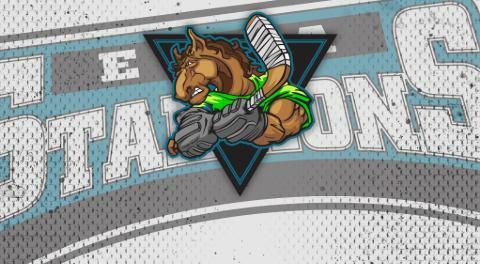 A win for the Stallions will put them in the CPJHL Presidents Cup finals for a second straight year. A loss to Maniwaki will see the Stallions host Maniwaki in a deciding game tomorrow night (Wednesday) at 7:30 p.m.
Whatever happens between these two clubs, will see the winner of the series play the winner of the Muskoka/Markdale series which is currently 1-0 series lead for Muskoka after a 6-5 OT victory for the Anglers on Saturday night. Game #2 goes Wednesday night in Gravenhurst, and game #3 (if necessary) will go Thursday night in Markdale.